MISSED goalscoring opportunities again proved so costly for Rangers as Dundee United booked their place in this year’s Scottish Cup Final with a 3-1 victory at Ibrox. After failing to find the net against Raith Rovers in the Ramsdens Cup Final the Light Blues were again guilty of poor finishing against their Premiership opponents, particularly in a first half they had dominated for large spells. Dean Shiels missed a snip before Stuart Armstrong opened the scoring on 22 minutes, the midfielder making the most of hesitant defending before beating Steve Simonsen. Gers top scorer Jon Daly would then have been disappointed not to level the scoring on 34 minutes when he blazed a left foot shot over and 60 second later United made it 2-0. Gary Mackay-Steven’s shot from 15 yards took a huge deflection as it looped over Simonsen and into the net following good play from Ryan Gauld. Rangers got the goal their play deserved with five minutes of the first-half remaining when Stevie Smith curled in a superb free-kick. This gave the League One champions a glimmer of hope but having again competed well in the second period a mistake from Simonsen with eight minutes left allowed Nadir Cifti to roll the ball in and clinch a memorable victory for the Tayside club. The pre-match atmosphere within the stadium was electric as both sets of fans producing colourful card displays as the players emerged from the tunnel for kick off. And the supporters decked in red, white and blue cranked up the noise levels further as their team made a positive start to the match. 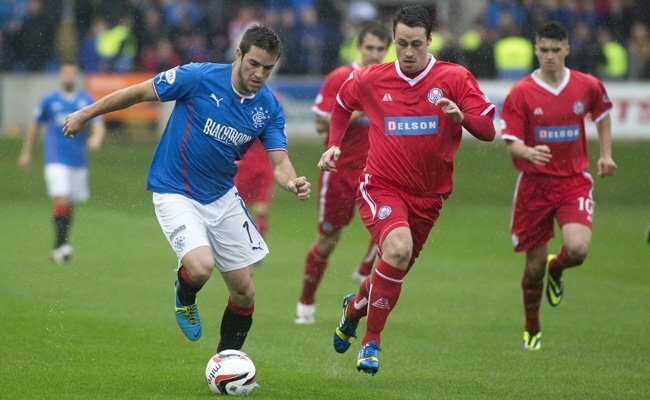 After two minutes a tackle from Daly on John Soutar allowed Fraser Aird to break free and win an early corner. The winger then produced a dangerous delivery and when McCulloch won the header the ball bounced dangerously in the six yard box before being cleared. 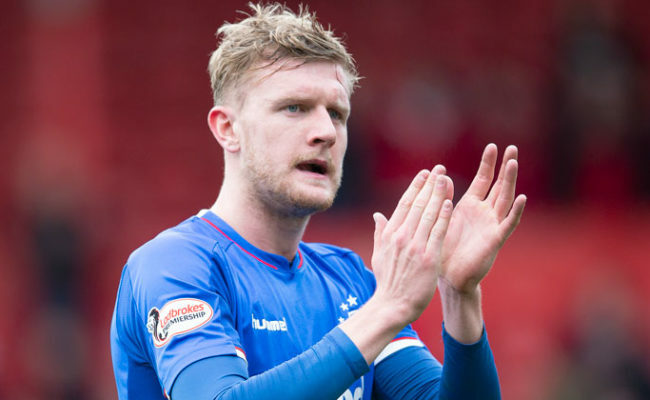 It was a pulsating start to the game and the Gers backline was soon tested when Armstrong skipped past one challenge before finding Andrew Robertson who drilled a shot straight at Simonsen. On 13 minutes Aird then tried his luck from distance and United’s number one Cierzniak was flapping as it flew past the top corner of his net. Richard Foster was having a strong start to the match but he was fortunate not to be booked for a late challenge on Armstrong before Shiels missed a great chance to break the deadlock. Aird played a great first-time pass through to the Ulsterman but with just the keeper to beat he skewed his shot wide. But for all of Rangers’ positive play in the opening 20 minutes it was the Tangerines who then got their noses in front. A poor clearance from Nicky Law was headed too easily back over the Gers defence to Armstrong who clipped it past Simonsen and into the net via the post. 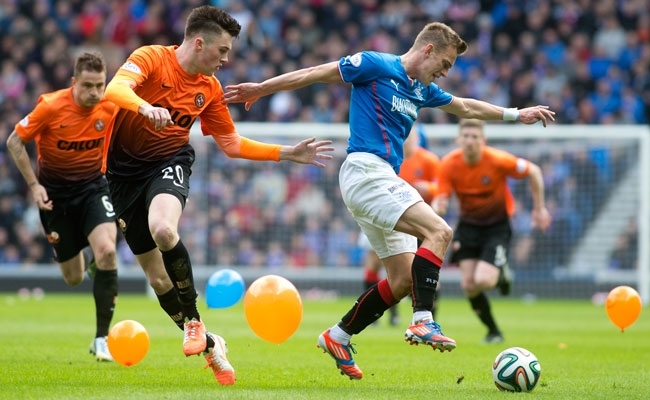 The United fans went wild and things could have got even worse for Rangers 60 seconds later. Gauld found Ciftci down the right channel and his powerful low shot across Simonsen was palmed away impressively by the big Englishman. On the half hour mark there was yet more drama but this time at the other end of the park. Law produced a tidy piece of skill to get away from his marker on the right and his hanging back post cross cannoned off the crossbar. The ball rebounded to Aird but his initial shot was blocked before United skipper Gunning threw himself over the penalty spot to deny Black. 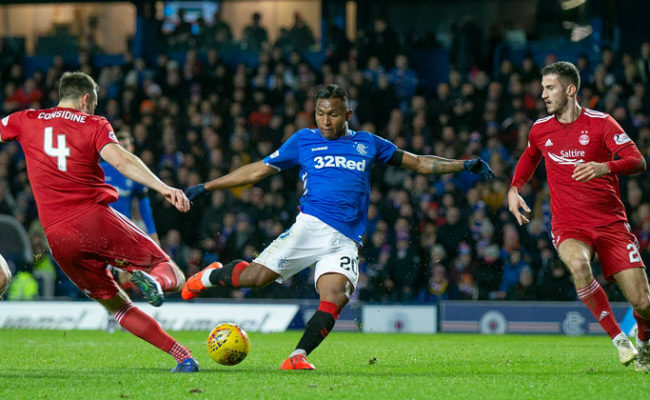 Missed opportunities in front of goal were proving so costly for Rangers and on 34 minutes this was again the case when Aird made a great run in behind the United defence. 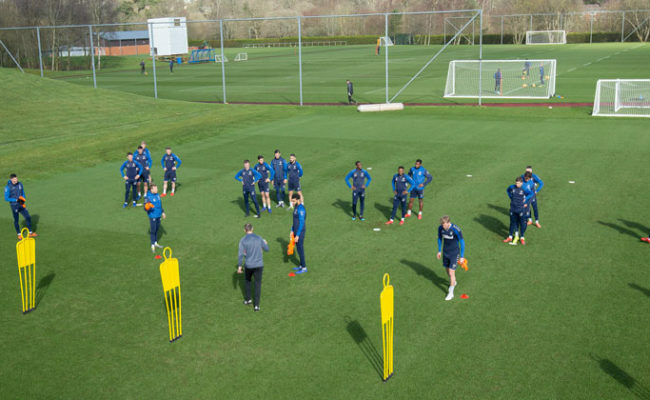 The Gers youngster was found by Foster and he could have taken a touch, turned and had a shot himself. Instead he fed it back to Daly but he blasted a shot over the bar when he should have at least have tested Cierzniak. 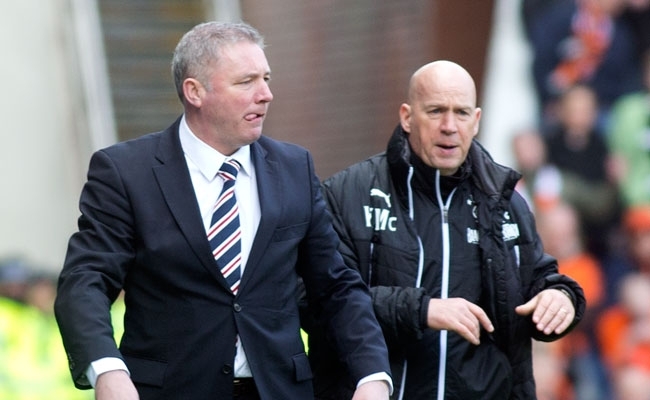 United then doubled their advantage and it was another poor goal for Ally McCoist’s men to concede. Gould did well to edge his way into the 18-yard box before cutting the ball back for Mackay-Steven and his deflected shot from 12 yards looped over Simonsen before landing in the net. 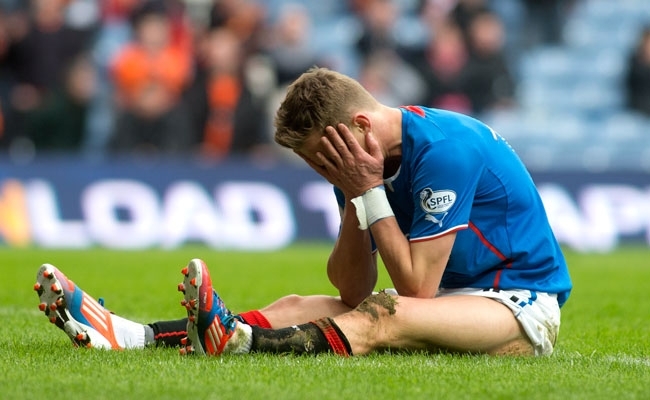 The Rangers fans fell silent but the first-half drama was not finished there. With five minutes remaining Black was bundled to the ground and from 30 yards Smith curled the ball over the wall and into the bottom corner of Cierzniak’s net. The big keeper got a hand to it but Smudger’s shot had the power and accuracy to sneak in. At half time Rangers didn’t deserve to be in the position they were in given the chances they had created but Smith’s free-kick gave the players and fans a lift as this intriguing contest restarted. United were always a threat going forward and on 50 minutes a long punt up the park made its way through to Armstrong. Simonsen hesitated slightly allowing the number 10 to get to the ball ahead of him but his lob over the keeper had too much power and dropped to a United fan in the Broomloan Stand. Smith had another opportunity to test Cierzniak from a free-kick situation after Shiels had been brought down by Wilson but his left foot curler hit the wall. With 77 minutes on the clock he then hit another free-kick, this time from just outside the 18-yard box, and although it took a wicked deflection off the wall Cierzniak was somehow able to get his hand to the ball and claw it out for a corner. With Rangers now pushing men forward there was always a danger this would leave gaps at the back and when substitute Keith Watson’s cross flew across the face of goal Ciftci was just inches away from getting his boot to the ball. With eight minutes remaining however the big striker was presented with a gift. Foster played a pass back to Simonsen who tripped over the ball, allowing the Turk to nip in before rolling in a simple finish into the empty net. At the final whistle the United players celebrated their win but Rangers can be proud of their efforts and they showed there is not much between them and the teams in the top half of the Premiership. But as Jon Daly said in his pre-match press conference yesterday the winner of this match would be the team that take their chances and, unfortunately, he was proved correct.